My name is Nancy and I appreciate you dropping in. As a mother of many children I’m excited to share my experiences in bathing babies with you. It is one of my favorite activities as a mom! You can read more about me on my About Me page. Bathing and cleaning your precious little one will be one of the most frequent tasks you will do as a parent. And one of the most enjoyable for not only your baby but also for you. In the past, bathing was usually done using the kitchen or bathroom sink, however nowadays using a special baby bathtub is the norm. 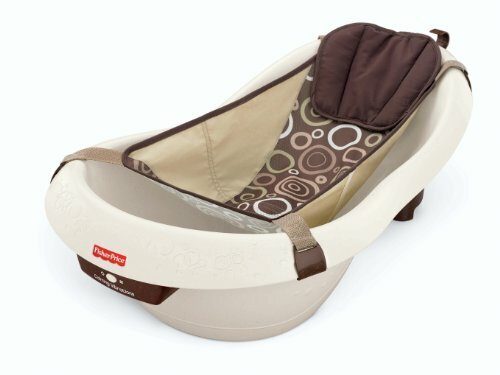 Apart from the usual crib, car seat, and high chair, a baby bathtub is one of the few items that your baby, and you, will frequently use from birth up to the early toddler years. Choosing between a baby bathtub or the traditional sink usually depends on personal preference. Although you can still do without using a baby bathtub, using one does have its perks like propping up a newborn easily and securely and being able to use both your hands. Plus, your sink or bathtub doesn’t have to be absolutely clean since you’ll be placing your baby bathtub inside. In general, it can make the whole process a lot easier and more fun for you and your child. How to choose a baby bathtub? With all the baby bathtubs that are available today it can be confusing as to which one to buy, especially for first-time parents. However, the main thing that you should always consider, whatever tub you buy, is safety. For young infants, tubs with reclined slopes to keep the back supported is a good feature. Some baths also have contoured and padded linings for added comfort, as well as crotch or side supports to keep the baby from sliding around too much. A temperature indicator is also available on some models – digital readouts or a sticker strip that changes color if water is too hot. Don’t worry if your baby’s tub doesn’t have one of these – you can always check by dipping your elbows and forearms instead of your hand, as they are more sensitive to temperature change. A non-skid surface on the bottom of the tub will keep the tub in place and prevent it from slipping around when your baby is moving inside. Inside the tub, the bottom should also have a non-slip surface to help keep the baby from sliding while being washed. A smooth rim with no jagged edges anywhere is also recommended to prevent the delicate skin of your baby from getting scratched when taking him or her in and out of the tub. A tub should be able to hold enough water so that you can bath your baby without running out of water and have his body adequately immersed. You don’t want there to be too little water so he starts to get cold due to too much of his body being exposed to the air. Preferably, your baby bathtub should either fit in a sink or in a regular bathtub, this is for convenience on your part. Most tubs today are designed to sit in a medium to large kitchen sink. Some even have a notch to fit over the divider of a double sink. By making sure that you can fill it with water directly from your water source this will save you time and effort. This will also ensure that the cleanup process will be short and sweet. A drain with an attached plug will make emptying the tub easier instead of having to tip over a tub full of water. Having an attached plug is the best as we don’t want one more thing laying around that your little one could accidently stick in his mouth. Most baby bathtubs have a plug and drain either on the sides or at the bottom. Even with drains, the tub will not be totally emptied. You typically have to tip it over and wipe it dry. Choose a tub that can be cleaned and dried quickly. This prevents mold, mildew and bacteria from building up and causing harm to your child. For a baby bathtub that conveniently grows with your child, the Fisher-Price Calming Waters Vibration Bathing Tub offers you three positions on how to safely bathe your baby according to his age group. 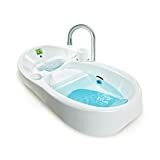 What’s also great about this tub is that it has a soothing water vibration setting that you may find helpful for babies who are not so fond of getting into the water. Calming vibrations. For babies who are afraid of bath time, switching on the soothing soft vibrations can help the baby relax while taking a bath. For newborns, a secure sling is provided that can be attached and detached from the tub. The sling is secured with sturdy clasps attached on the rim. It also includes a soft padded pillow for the back and head to rest on. For older infants, who are bigger and can wriggle a lot, a baby stopper insert is also included to help secure your child in place while still in a reclined position. 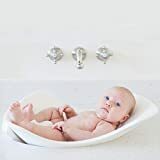 For toddlers, or older infants who can sit up straight, just remove the newborn sling and baby stopper insert so your child can sit and play in a deeper tub. Clean up and storage. An attached plug will let you empty the tub with no hassle. You can also let it dry or store it by hanging the tub using the hook provided. Fits in most single and double basin sinks. The neutral color and décor will suit both boys and girls. It can fit in a sink. Hassle-free. You can easily transition from newborn to infant to toddler without any hassle because the instructions are clear and easy to follow. Clean up process is easy with the use of the attached plug and the hook included for drying or storing the tub. According to a few parents who reviewed the product, the water vibrations can sometimes startle the infant. Cleaning up the insides of the baby stopper can be meticulous and if the insides are not cleaned, dirt and molds have the tendency to build up inside. The smooth surface (floor) of the tub can be slippery. The Fisher-Price Calming Waters Vibration Bathing Tub is a great convertible baby bathtub to help make bath time for you and your little one a breeze. The sling design for newborns will let you bathe your child with both hands and with the pillow included, your baby can rest comfortably. And because it is designed to make transitioning from infant to toddler possible, this will save you money in the long run. Bathing your baby in the sink has never been this easy and stylish. 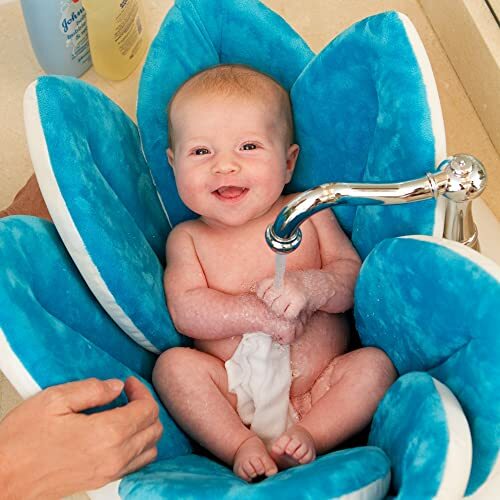 The Blooming Bath – Baby Bath will softly cushion your baby to make bath time in the sink cozy and enjoyable. It is made of quality materials to ensure that it is safe for your baby. And because you can wash your baby in the sink, backaches will never be an issue after. Flower design with plush petals surrounding and protecting your child from the sink and a soft center for your child to sit or lay on. The Blooming Baby Bath will mold itself perfectly on most sinks. So you can give your baby a bath anywhere there’s a clean sink available. Eliminates the hassle and the stress frequently bending over a tub puts on your back. Washing it is easy, you just squeeze off the excess water and put it in the washing machine for a few minutes to tumble dry. Reclines the baby comfortably when bathing. It can be quite heavy when really soaked with water. Hard to squeeze the excess water out manually. Drying process is long, and according to some parents who reviewed the product, it can take more than a day for the foams to get really dry. Can build up mold and mildew after a while. Because the product is designed to soak up water, instead of pool it, the water that is on the foam already gets cold thus making the other parts of the flower cold from soaked up water. A few people who reviewed this product had experienced the petals getting ripped easily after a few uses. The Blooming Bath – Baby Bath is a good choice for bathing your child comfortably in the sink. 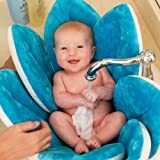 It’s made of very soft materials that your baby will truly enjoy, plus the vibrant colors and the cute flower design makes it a very adorable bathtub for a baby to use. However, some effort may be required from you when tidying up after every bath. The 4moms Baby BathTub is an innovative change on how parents can now easily bathe their child. A baby’s bath commonly involves soapy, dirty water with your baby playing in it until it’s time to rinse off with fresh water. By then, you would have to have a basin of fresh water ready nearby and just warm enough to clean off the soap and dirt from washing your child. With the 4moms Baby BathTub you don’t have to go through all these hassles again as this tub is designed to solve all that. Has a 2-inch LCD screen that clearly displays the temperature of the water pouring out of the faucet. Has a temperature sensor to instantly gauge running water temperature. Has a digital thermometer that displays color-coded results according to temperature. When the water gets too hot, red light is displayed. If the water is too cold, blue light is illuminated, and when the water reaches the perfect temperature just right for your baby to enjoy, the light turns green. Red light also comes with warning beeps. Has a separate reservoir for collecting clean water. Dirty water is automatically let out through side drains. Has a rinse cup and integrated rinse cup holder. Your baby is continually soaked in clean water only. Strategically located drains will let you have control over the amount of water that gets continually collected. This ensures that the water is just high enough according to your liking, although it automatically does not collect too much water due to the side drains. Has a temperature display and sensor to help you keep track of how hot or cold the water is. The warning beep for water getting too hot is also very useful so you don’t have to constantly check the water and in case you forget to check. Rise cup and rinse cup holder are useful tools for bathing your little one. Fits in most sinks and standard bathtubs. Can take up too much space during use and also when storing it. Can be easily outgrown by babies as they grow big or tall. A few parents had some problems keeping small babies in place without the help of some blanket to keep them from slipping into the water when they wriggle. The 4moms Baby Bath Tub, White can be expensive, but this is understandable because of the unique and useful features that it offers. Overall, the most outstanding feature that makes it appealing is the temperature sensor with warning alarm since it is a great precautionary tool that helps you ensure your child’s safety. 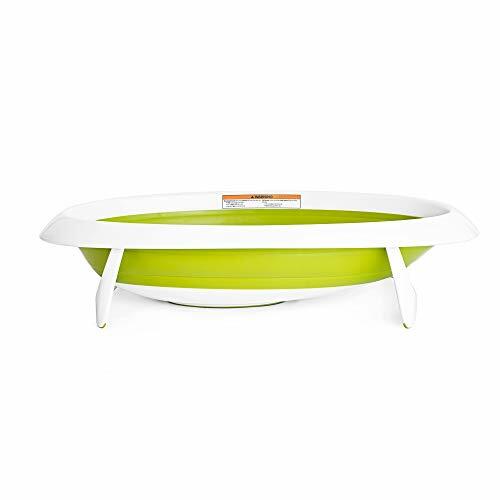 The Boon Naked Collapsible Baby Bathtub Green is a simple-looking tub designed to keep things light and easy when it comes to bathing your baby. The tub is made to accommodate newborns and toddlers. It has a collapsible design so transitioning from different stages is hassle-free. Plus, the simple design also makes the set up and clean-up time a breeze, great for everyday use. Collapsible. This fold-up bath can be easily changed from one position to another depending on the age of your baby. This also allows the tub to be stored in a flat position and also for hanging it to drip dry. 2-stage support position. To accommodate infants and tots, you can change the tub to a reclined position where the head is above the water and the infant being cradled when bathing. This position is great for newborns and young infants. 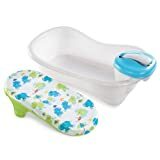 As your child grows and when he’s able to sit upright, you can fully expand the bottom to make the tub deep, like a basin, so your baby can sit and play during bath. It has two support braces to support it. It has a built-in drain plug for easy drainage. When flat, the tub is compact and can be easily stored. Has a hook included for easy drying or storage. The tub is designed as a single piece. Meaning, you won’t have to worry about missing loose parts when moving it around. No harmful chemicals were used that might cause harm to your child’s health. The smooth surface of the interior makes it slippery for the child during baths. Some people who have reviewed this product had issues of the tub collapsing while in use. 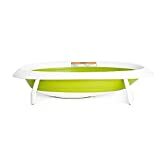 The Boon Naked Collapsible Baby Bathtub Green is a good choice if you want a tub that is sturdy and portable at the same time. Although quite expensive, it can save you money later on since you don’t have to buy another tub as your baby grows bigger. Traditional bathing in the sink is easier with the help of the Puj Tub. It is soft, flexible and molds naturally to the shape of any sink. It soft texture will also be comfortable for your baby as it also molds itself to the shape of the body as it cradles your child while being washed. The foam is comfortable for the baby to lay on. It has a soft, cushiony feel. Fits on most standard-sized sinks. Can be easily cleaned, and dries quickly. Can be stored hanging or placed in a cabinet. It’s not bulky so it won’t take up too much space. Lightweight and easy to carry around. Can be brought when travelling. No toxic chemicals are used in making the tub. You need to keep the faucet water running to have enough water to bathe your child as the tub itself only holds a small amount of water in it. Clean up can be challenging especially if you have a very excited and wriggly infant as the tub has the tendency to easily let water overflow. Some people who reviewed this product said that the tub was too big for their sink. The Puj tub is a great choice for bathing newborns, for older and more active infants, bathing in the Puj tub can be quite challenging as the child can easily displace the water thus wetting the floor around it. 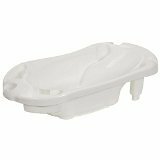 However, if you need a bath that can be easily stored, easily assembled and can be brought for travels, this is a great choice for a portable bath tub.